While the name Rossi is synonymous with motorcycling thanks to the rise of Valentino Rossi, 9-time world champion and most winning premier class racer of all time, New England’s John Rossi has maintained his front-running position as one of the premium race travel companies. By bringing his 35-years of motorcycling, race, and moto-event experience to the forefront, John Rossi founded VivaDUCATI.com in 2007 and has hosted VIP race travel packages to the inaugural Indianapolis MotoGP in 2008 and again 2009 as well as to the US National Dirt Track Championships known as the Indy-Mile. Rossi will expand his premium race travel packages for 2010 to both U.S. MotoGP venues held at Mazda Raceway, Laguna Secca on July 23, 24, 25 in Monterey, California along with his third year return to the Indianapolis MotoGP on August 27, 28, 29 and the Indy Mile Dirt Track on August 28. Laguna and Indy are two renowned U.S. race circuits that figure significantly into the world stage of MotoGP, the premier venue for motorcycle racing known across five continents. John Rossi typically host upwards of 100 VIP guests delivering 3-days of exceptional, turn-key personal service and amenities that the most discerning moto-enthusiasts and their guests can fully appreciate. 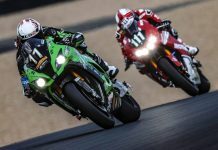 The competition at this level is among globe-trotting factory teams such as DUCATI (Casey Stoner, 2007 MotoGP World Champion, Nicky Hayden US rider, 2006 World Champion) Yamaha (Valentino Rossi, current and 9-time World Champion) as well as teams Kawasaki and Suzuki and many privateer teams. • Private motor coach from hotel to the track on race day – or ‘ride in’ if you choose. • International and Domestic Air Travel can be provided to individuals and groups upon request. Rossi’s VIP Access Travel Packages offer sanctuary for parents traveling with children (age 9 – 12) as John is a father who typically travels with a young son to these races. "There is a heightened level of service that is simply expected for a MotoGP race which is the Olympic tier of our sport. I host people from the US and abroad that represent all walks of life and ride all sorts of motorcycles. What they want most is a world class MotoGP race experience that eclipses the time-worn bleacher seat or grassy, dusty, muddy mound, or a single manufacturers encampment." "My clients and I have all done our share of grass-roots rides and spectator track events from a tent or camper and we still do but, not for the MotoGP. It is a honor to host race fans and their families that truly appreciate this level of quality and to create an unparalleled travel experience" stated John Rossi. Space is extremely limited for these travel packages and pricing begins at around $850. The specific offerings may vary slightly between each race locations. To make your individual or group reservations, or for more information please visit: VivaDUCATI.com / RossiMotoCorsa.com or contact JRossi@VivaDUCATI.com.